The new Skype will be pushed to Android first, not Windows. Microsoft announced a major redesign of its Skype app on Thursday, helping users foster an improved social network of sorts among their best friends, while an army of helpful bots stands ready to offer recommendations and cat GIFs. Skype hasn’t eliminated the ability to chat with your friends, and it’s actually enhanced it with a live camera feed and the ability to quickly share news and other information around your network. 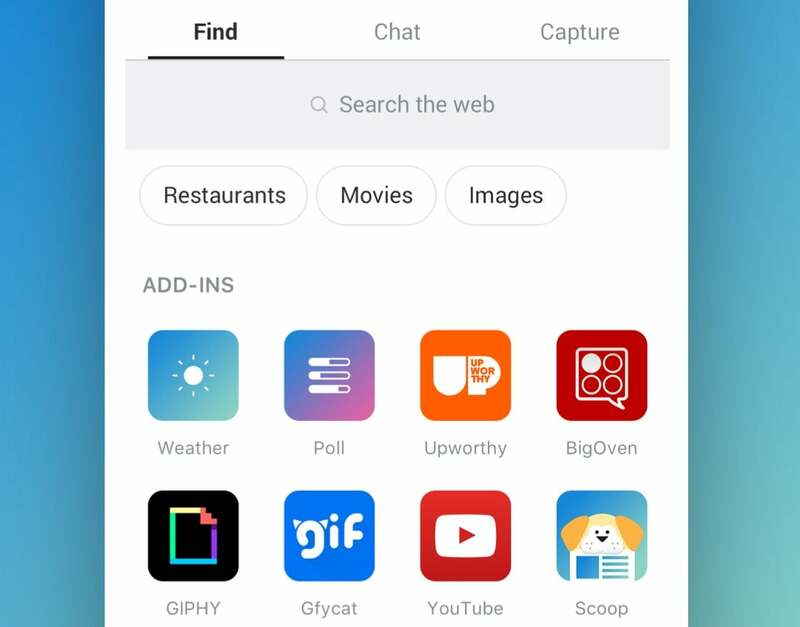 But among the first screens you’ll see is a new “Find” interface that taps into bots and other services to help you discover new information. And unlike releases past, the new Skype will first be pushed to mobile: specifically Android, with iOS arriving in a month’s time, then Windows to follow later. 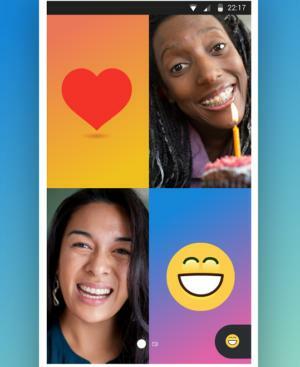 The core of the new Skype's “intelligent communications experience” is a way to share your experiences with your closest friends, explained Amritansh Raghav, the corporate vice president of Skype. But the idea of a social network has expanded, he added. It includes your personal friends, but might also include a series of apps and businesses that you exchange data with regularly. Skyope chats now allow for reactions. Why this matters: According to Raghav, the new Skype represents the most significant update in more than a decade. Mobile communications has certainly evolved, with a new generation forgoing phone calls and possibly even texts to communicate on new services like Instagram. Can Skype bridge the gap between the older generation who grew up on voice and video calls, and reach those who prefer quick chats like Whatsapp? Microsoft’s making a huge bet that it can. The new Skype will probably remind you of other apps you’ve seen: Google Assistant, perhaps, or Allo. That’s because Microsoft has baked intelligence right in. Cortana will suggest in-chat responses to queries or comments your friends have sent you, just like Google’s app. But the new Skype really doesn’t seem to be as much about Cortana as it is around a network of bots and add-ins that can chat with you around specialized topics. Scoop provides snippets of news, for example, while a Weather add-in supplies a forecast. The difference between bots and add-ins is somewhat subtle. Add-ins are sources of information that you can access, while a bot is a “voice” that you can actually interact with with followup questions. Some, like Scoop, are both, Raghav said. It’s important to reiterate that the new Skype app doesn’t push video or voice calling. Instead, the new Find page encourages you to explore the real and virtual world around you, searching out restaurants, movies, or images. It’s an interesting tonal shift. With the Cortana app on Windows and mobile platforms, interacting with Cortana is a one-to-one conversation. 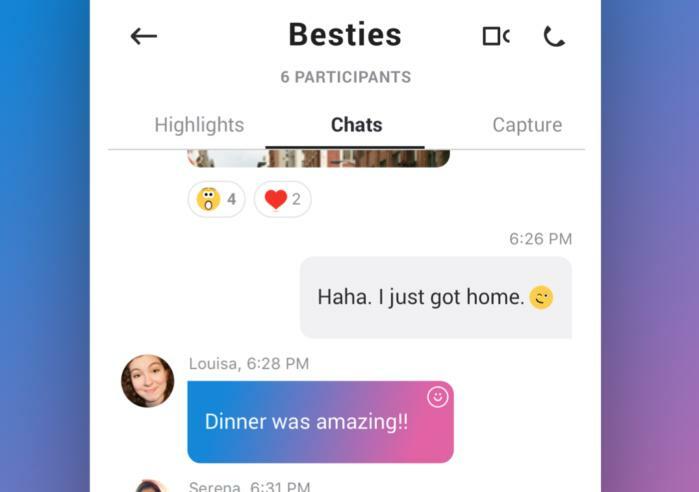 In Skype, Cortana’s by your side to assist with suggested responses, but it appears that Cortana’s new role within Skype is just one of many participants in a room. New sources of information, including add-ins and bots, are available though Skype as well. Intelligence also factors into a new tab on Skype, called Highlights. If you’ve used Microsoft’s Photos app or OneDrive, you may have noticed that Microsoft periodically creates an “album for you,” with photos from a given date or location grouped together. With Skype, you’ll be able to sample what Microsoft calls “Highlights” from other users: a photo summary of their week, which will be available to other users for seven days. It’s not quite an Instagram feed, or Facebook, but it is a quick and easy way to catch up on a friend’s trip to the mountains, for example. Finally, there’s what Microsoft calls the “smart camera.” In recognition that users tend to share photos as much or more than any other type of media, at any time you can swipe to the right and turn on your phone’s camera, either snapping pictures or streaming video. Like the Windows Photos app, you can ink on the video or add a sticker. If the video is being shared in a chat, your friends can add real-time reaction to what you’re sharing. Finally, of course, there’s Skype’s traditional text- and video-chat options, which have also received an overhaul. Most of the enhancements to text chats involve the intelligent responses and conversational interactions with bots. You’ll see elements from past versions of Skype and Teams creep in, however. You can respond with emoji and Microsoft’s custom “moji,” add polls, share live or archived video, record audio, append comments with reactions, and more. If you are typing, Skype will use a new “soundwave” icon to indicate your activity. The new Skype video chat also includes reactions, too. The same reactive approach also applies to video. Even on mobile, you can resize the video windows on screen—something you couldn’t do previously—to allow you to determine the most important speaker in the conversation, not Skype. And yes, you can react to what a speaker is saying as you traditionally would—say, with an actual gasp—plus the new reactionary emojis that Microsoft has built in. There’s even a rather cool “recap” feature. If you missed a video chat between your friends, Skype saves the important elements: photos and video that were shared, audio, reactions, and more. It’s not as good as actually participating, but you’ll at least know what your friends were talking about. With Amazon busily adding “skills” to its Alexa-powered devices and Google enhancing its own Assistant, the race is on for developers to tap into Skype, as well. Microsoft hopes that by later this summer, when the new Skype is rolled out on iOS, Android, and Windows, that developers will start to see the power of combining all three mobile ecosystems under Skype. It’s another sneaky way to push Microsoft’s intelligent services to platforms like iOS and Android, just as it did with Cortana.